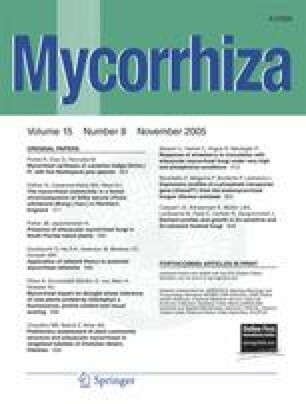 Arbuscular mycorrhizal (AM) fungi have long been shown to successfully contribute to phosphate uptake by plant roots. The first step of the fungus-mediated uptake is carried out by fungal membrane Pi transporters (PT) that transfer Pi from the soil into the extraradical hyphae. In the present work we report the identification and characterisation of a PT gene from Glomus mosseae, an AM fungus important for natural and agricultural ecosystems. Degenerate primers and rapid amplification of cDNA ends–polymerase chain reaction (PCR) allowed us to obtain a sequence (GmosPT) showing a highly significant similarity with GiPT and GvPT, the only two other PT genes already isolated from AM fungi. Reverse transcriptase–PCR experiments were carried out to study GmosPT expression profiles in structures corresponding to different fungal life stages (quiescent and germinated sporocarps, intraradical and extraradical hyphae) and in extra- and intraradical hyphae exposed to high and low Pi concentrations. GmosPT showed an expression pattern similar to GiPT, the Glomus intraradices PT gene, since its transcript was more abundant in the extraradical mycelium treated with micromolar Pi levels. In addition, the intraradical mycelium also showed a significant GmosPT expression level that was independent from external Pi concentrations. This finding opens new questions about the role and functioning of high-affinity PT in AM fungi. This work was funded by the EU GENOMYCA project QLK5-CT-2000-01319, the Italian Firb Project (Plant-Microbe Interactions) and CEBIOVEM (D.M. 193/2003) grants.